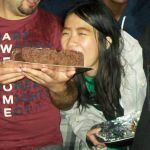 Freakshakes are causing a frenzy all over BuzzFeed, Instagram thanks to their Insta-worthiness and appealing to the general publics sweet tooth and appetite for epic food challenges. The Beehive Coffee House has been absolutely buzzing with bees-iness thanks to the free publicity from Facebook and Instagram. You only have to take a glance of their Facebook page to see people tagging their friends begging them to go there! For two weeks only, they are open till 9 pm serving festive bites and drinks. I had the Boozy Caramel Hot Chocolate Attack with Bailey’s. Nutella, popcorn, caramel drizzle, chocolate discs, pretzels, a wafer roll, candy cane, doughnut, marshmallows. The owner, Phoebe Lau (her family own the Golden Dragon takeaway next door, BTW – I didn’t believe my colleague when he told me) made me a new hot chocolate for my photo op cos the whipped cream on mine was melting, causing the toppings to droop! 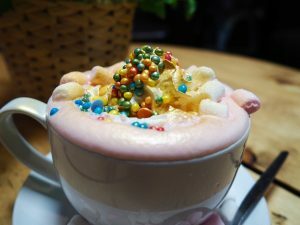 I also obliged to photograph their newest creation, the Unicorn Hot Chocolate with marshmallows, pearlescent hundreds & thousands and gold dust! Isn’t it pretty?! Hailing from Penang, the world's #1 street food capital. Recreating food I had in restaurants or can't get in the UK.